“The “Most Cited Award” marks another milestone for both of us as this is the first time our paper is honoured as a most cited paper. 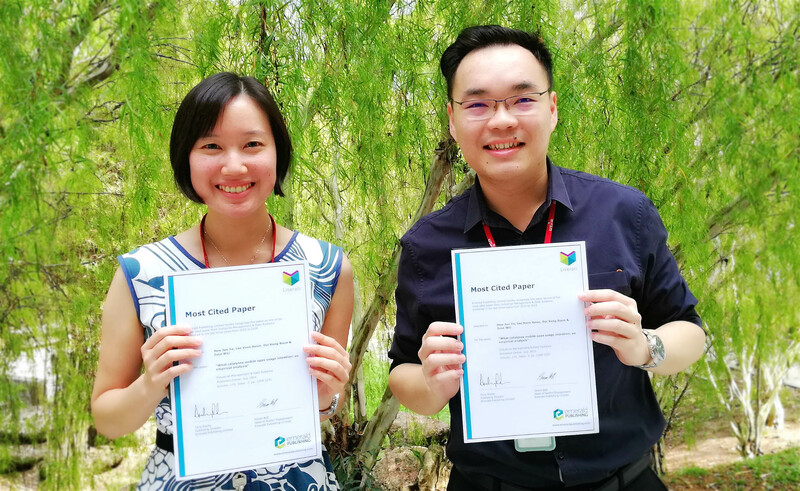 Although we have received several most downloaded awards prior to this award, “Most Cited Award” is something different and more precious, as download rate does not always translate to citation counts successfully,” said Faculty of Business and Finance Academics Assoc Prof Dr Lee Voon Hsien and Hew Jun Jie. They were recently awarded the “Most Cited Paper” award by Emerald Publishing Limited, for their research titled “What catalyses mobile apps usage intention: An empirical analysis”. The research was co-authored with UCSI University Academic Prof Ooi Keng Boon and University of West Florida Academic Prof June Wei. Emerald Publishing Limited recognises this paper as one of the most cited papers from Industrial Management & Data Systems (Emerald, UK) published in the last three years from 2015 to 2018. Their research looks into the lack of understanding of the mobile applications (mobile apps) market and low usage rates among Malaysians, and adapted the Unified Theory of Acceptance and Use of Technology 2 (UTAUT2) together with gender and educational levels as the moderators to investigate the determinants of consumer behavioural intention (BI) to use mobile apps. A total of 288 sample data was collected and analysed using partial least squares structural equation modelling (PLS-SEM) method. All of UTAUT2 constructs (i.e., performance expectancy, effort expectancy, facilitating conditions, hedonic motivation and habit), except for price value and social influence, significantly relate with BI to use mobile applications. Habit was reported to have the strongest influence. Gender and educational level were found to be insignificant moderators. Mobile application developers could therefore have a better understanding on users’ needs and intention, based on the findings. Dr Lee and Hew were also recently awarded the “Most Downloaded” award by Telematics and Informatics (Elsevier, USA), for their research titled “The interactive mobile social media advertising: An imminent approach to advertise tourism products and services?”. Co-authored with FBF academic Garry Tan Wei Han, UCSI University academic Prof Ooi Keng Boon and Xiamen University Malaysia academic Dr Wong Lai Wan, the research is listed as one of the Most Downloaded Telematics and Informatics Articles based on the numbers of downloads in the last 90 days. Industrial Management & Data Systems (IF = 2.948 as per JCR-2017) is currently indexed with Clarivate Analytics under the Science Citation Index Expanded (SCIE).